A man was hit and killed Tuesday when a car involved in a crash with another vehicle jumped the curb and struck him as he napped outside the Ruben Salazar Senior Center in unincorporated East Los Angeles. According to witnesses, at about 12 p.m. Tuesday, a car speeding west on Whittier Boulevard near South Ditman Avenue crashed into another car, hitting it so hard it flew across traffic lanes and into the park where it hit the victim. The Coroner’s office confirmed the man died but declined to release the man’s identity, pending notification of his next of kin who are believed to be living in Mexico. 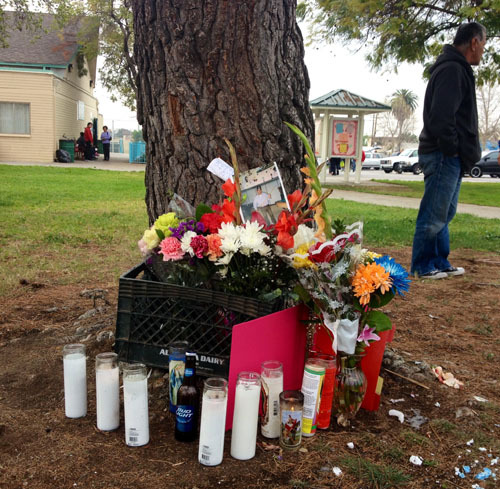 Several people who frequent Salazar Senior Center, however, identified the victim as Jesus Valderrama, a regular visitor to the park. They were unsure of his age. Chuy, as he was known, would nap on the grass nearly every afternoon before going into the Center to play pool and socialize with other seniors, they told EGP. Javier Solis said he and Valderrama were close friends. He said he was inside the Salazar Senior Center when he heard a loud noise and ran outside to see what had happened. 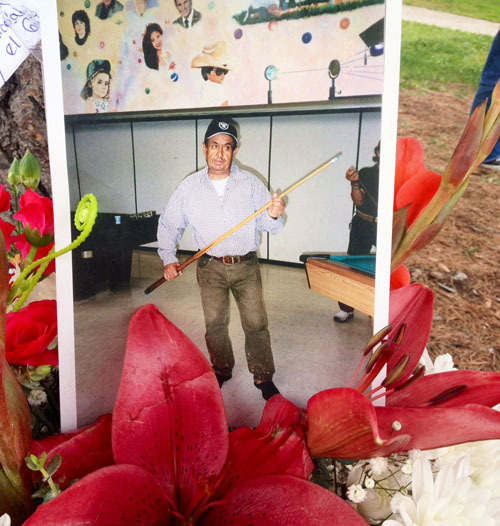 “He was crushed between the car and a tree,” said Solis, who was passing out copies of a farewell letter he had written in Spanish to his friend to people visiting the growing memorial next to the tree where Chuy was killed. Solis said he and several people taking a Zumba class rushed over to help Chuy. We tried to lift the car off him, but he looked in “really bad condition,” Solis said Wednesday. “He was still alive when we removed the car,” said Luis Mejia, another regular at the eastside center. He told EGP a woman tried to perform CPR on the man who was crunched, but did not appear to be bleeding. “Then the paramedics arrived, very quickly,” he said. According to witnesses, three people were in the car that struck Valderrama. EGP was unable to verify the name of the victim or whether any arrests were made in connection with the crash. Calls to the East L.A. sheriff detective handling the case were not returned as of press time. Will any charges be filed against the person driving the car?